OVERLAND PARK, Kansas - October 23, 2018 - Bushnell sponsored shooters won or placed in several key matches throughout October. From Multi-Gun to Precision Rifle Series (PRS) competitions, Bushnell optics and shooters excelled throughout the month. 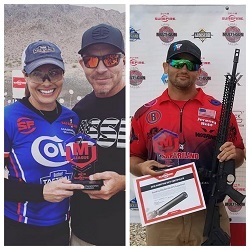 Maggie Reese and Jeremy Reid won several titles at the recently completed United Multi-Gun League (UML) World Multi-Gun Championships in Henderson, Nevada. Reese took home two titles: High Lady Overall and High Lady in 2x4. Reid took first place in the Limited Division. The UML World Multi-gun Championships is a 16-stage match that brings all three styles of multi-gun competition to one place. Reese, a three-time National Champion in USPSA Multi-Gun, captured her division titles with a combination of the Bushnell Elite Tactical SMRS 1-8.5x24mm, AR Optics First Strike and AR Optics TRS-26. Reid won the Limited Division using a Seekins Precision NX18 topped with a Bushnell Tac Optics Lil’ P(rism) illuminated prism sight. Meanwhile, Team Bushnell shooter Robert Brantley took second place at the Jurassic Classic PRS match in Morgan, Texas. Brantley, who was recently crowned King of the 2 Mile, was shooting the Elite Tactical XRS-II. Bushnell Sponsored Shooter Corinne Mosher put her Bushnell Enrage red dot through the ringer at this year’s Rifle Dynamics Red Oktober Kalashnikov Competition in St. George, Utah. Mosher placed seventh in the Open Division and 13th overall out of 301 shooters using the tough-as-nails AR Optics Enrage.